We are committed to strengthening the communities in which we have branches by supporting organizations, charities, and events that reflect the values of our members, our employees, and our communities. Over the years we’ve contributed hundreds of thousands of dollars to local events and initiatives; here are just a few examples! Hurry (or in our case ‘furry’) hard! Curling and Manitoba winters go together like peanut butter and jelly. We’re proud of our Manitoba curlers and try to cheer them on whenever we can. With numerous team sponsorships and past support of events like the Scotties Tournament of Hearts and The Grand Slam of Curling, we like to think of ourselves as one of the best arm-chair skips around. Helping pups in a ‘ruff’ spot! Our love of dogs extends way past our D.O.Gs! 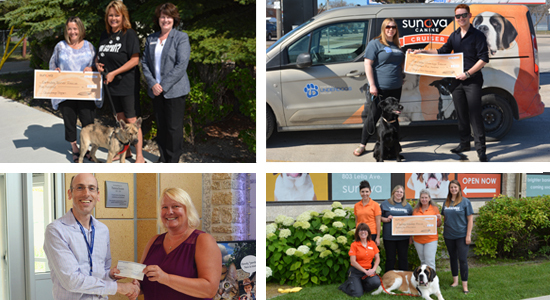 Since 2015, Sunova has donated over $44,000 to dog charities like Manitoba Underdogs Rescue, Earthdog Terrier Rescue, Pawed Pals Rescue, and the Winnipeg Humane Society. We think that giving back to our furry friends is important (and Gallagher and Lily agree)! 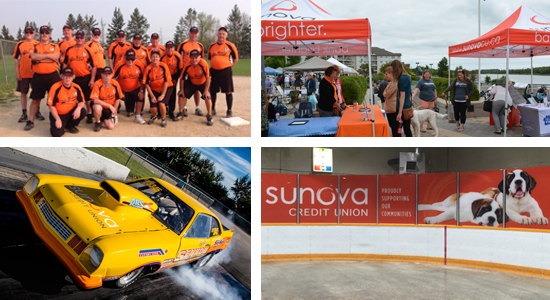 The Sunova Golf Classic is Sunova Credit Union’s signature charitable event, where we raise funds for a charitable cause while wowing our guests with an exceptional tournament experience. Our goal for the tournament is to raise money for a deserving charity, sell out the tournament, and host a fabulous event that will encourage rave reviews from participants and sponsors! The 13th Annual Sunova Golf Classic, which was held on Friday, June 18, 2018 at the Pinawa Golf & Country Club, was a huge hit. Once again the tournament sold out and was a fabulous success! Most importantly, the tournament raised a spectacular $20,535 for this year’s recipient, the Stonewall Kinsmen Splash Pad Project. We don’t just talk about supporting our communities, we put our money where our mouth is! Through our community investment program, we support tons of events, organizations, and community initiatives each year. Maybe you’ve had a chance drive past the Sunova Centre in West St. Paul? We love being part of their community! Love hockey? You should check out our sponsorship of the Teulon Rockwood Community Centre! Maybe baseball is more your jam? The Lee River slow-pitch senior co-ed team is proudly rocking’ Sunova orange jerseys! We love our members, and we’re proud to play an active role in our amazing communities!